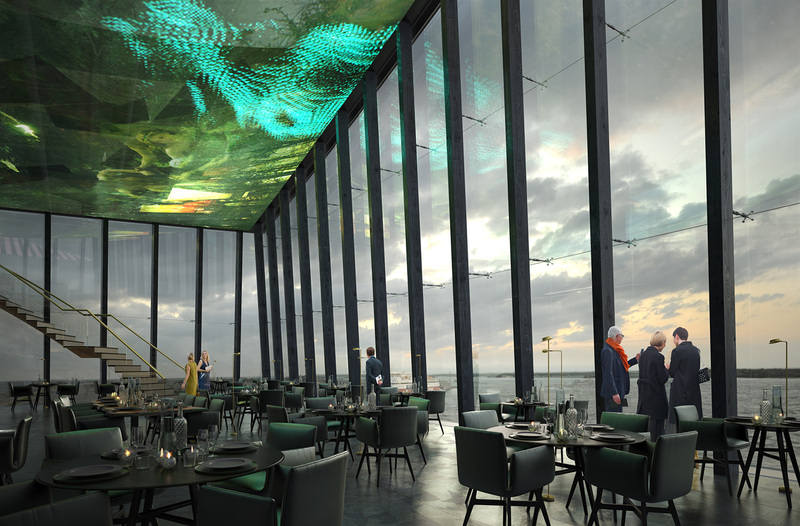 Rendering of the winning design for the new Guggenheim Helsinki by Moreau Kusunoki Architectes. 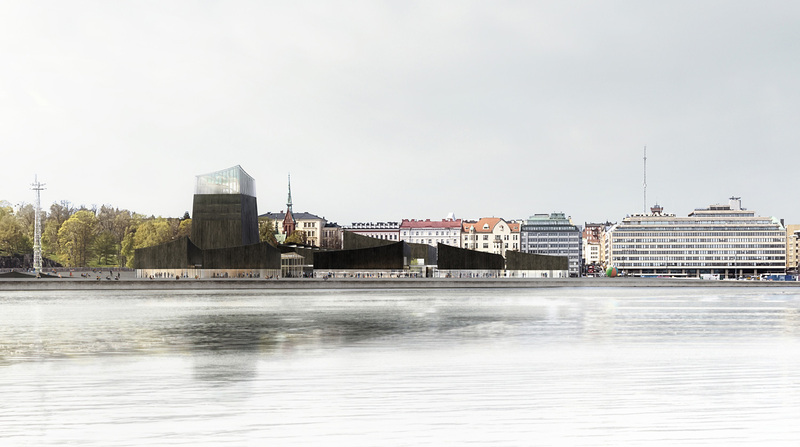 One year and 1,715 entries later, the Guggenheim Helsinki Design Competition has selected Paris-based Moreau Kusunoki Architectes as the grand-prize winners today for their design, "Art in the City". 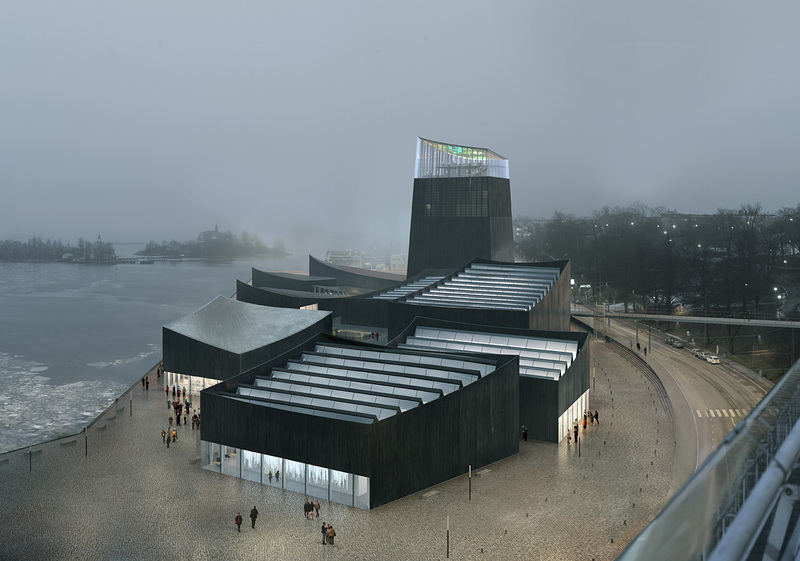 In recent years, the Foundation's plans for building a new Guggenheim in Helsinki prompted lively debate among local residents and architects worldwide alike, including the launch of the Next Helsinki counter-competition that wondered whether Helsinki even needs a Guggenheim Museum. But just like the whirlwind of discussions around the project, the competition itself is just as memorable: Stage One reeled in an astounding 1,715 anonymously submitted entries from around the world last fall, attracting a variety of designs ranging from the safer-yet-promising to the bolder-but-downright wacky. By the start of Stage Two this past January, only six teams – whose team names remained unidentified – made the cut. Over the following months, each finalist team received additional briefing to develop and refine their proposals. The public also had the chance to engage through a public exhibition, presentations, and other activities. Founded by husband and wife team Nicolas Moreau and Hiroko Kusunoki in 2008, Moreau Kusunoki Architectes is based in Paris, but has roots in Japan. Moreau had previously worked at Sanaa and Kengo Kuma, and Kusunoki worked in Shigeru Ban's studio early in her career. The majority of their work as a firm is located in France. As the competition winner, Moreau Kusunoki Architectes will receive a cash award of $113,000, however it's still not assured that the museum will be built. According to The New York Times, Finland is still concerned over the museum's cost, and has commissioned another cost study by Oxford Research. The initial 2011 estimate was set at $177 million, and while that number is expected to go down, it didn't account for any specific design. And so far, the design is not winning over everyone. In The New York Times' report, vice chairman of Helsinki's executive board (the entity that will decide whether to move forward with the museum), Osku Pajamaki, called the lighthouse symbol in the design's charred black wooden form "arrogant". 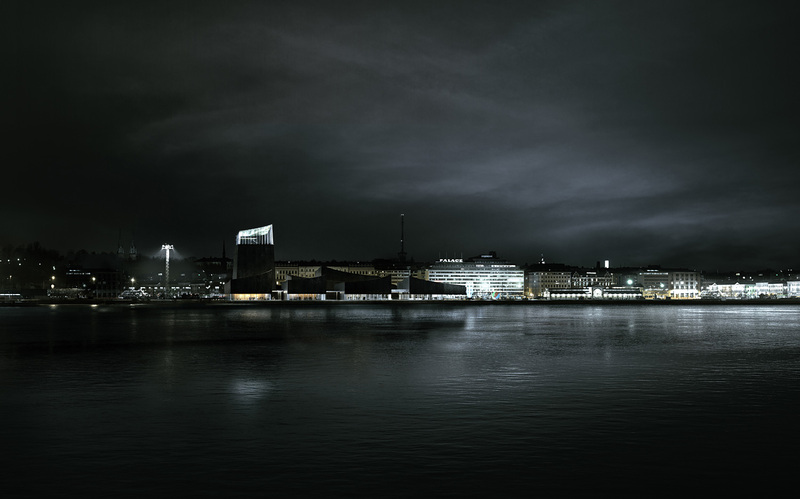 There is also concern about how the museum's overall presence in the harbor, Helsinki's door to the world, will relate back to the city – Eric Adlercreutz, a Helsinki architect unaffiliated with the competition, commented that the black color clashed with the city's slogan, "The White City of the North". Despite this, the architects have commented that their design was meant to "try to make a building that is closely linked with the city, with the way people use it," hence the name, "Art in the City". Check out additional coverage on Bustler, and have a look at the winning entry below. ...wondered whether Helsinki even needs a Guggenheim. No, no it does not. This article on how large museums and the art world in general survive on the unpaid labor of thousands (I include the place I work in this, in some measure) is relevant to this project in particular but also, if one changes the word "artist" in the article to "architecture grad", the parallels are clear. Does that have any to do with the design though? I agree that fair wages for labor needs to be addressed and examined continually. But I still think that a major museum at this location will add to the cultural life of Helsinki. And it will also propel this a more-or-less unknown firm. It may also establish a model for other high profile projects that could shift us away from the star-system that favors a relatively small group of extraordinarily savvy global firms. It so racist... what you mean white? I don't know, davvid. Doesn't Helsinki have a cultural life already? Do they need a global brand to make their cultural landscape complete? My criticism of the process isn't a criticism of the design, and I think the opportunity for a little-known firm to achieve attention for what appears to be good work is the best-case-scenario outcome for this kind of competition. But this "golden crumb" scenario is also a continuation of the ongoing dysfunction of global inequality, and Guggenheim more than many is a beneficiary of this system. Hmm.. I agree with you that unpaid competitions are exploitative. The more I look at it the more I like it. The exterior cladding is charred timber, which is kind of a trendy material but in the best possible way - one hopes that smart, sustainable, traditional materials like wood can stop being trendy and move into being the norm (I have a charred wood building by Marlon Blackwell at the museum where I work and it's aging beautifully). The "interior street" space does set up nice curatorial display options with the interior-exterior relationships (the jurors noted this in their statement, and I agree with them). I appreciate that it's a somewhat humble building, rather more like a collection of small buildings, instead of being one huge obvious statement (like The Glorious Potato of the first round entries). The hand-drawn-appearing renderings are wonderful. 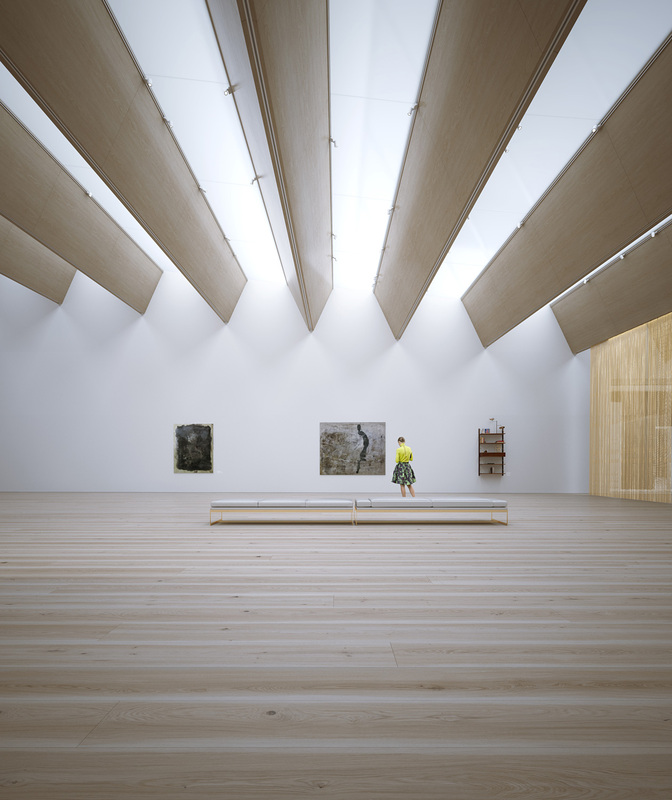 ....and also the handling of interior light in the gallery spaces seems lovely. Surely somewhere in the submissions there are entries that are thoughtful proposals for habitable and emotionally resonant space. I think this winning proposal meets those criteria. I like the design very much, but worry very much a totally green firm will struggle to acheive a built work that lives up to the image and proves to be durable. This project is already showing itself to be complicated and controversial (due to the client/city relationship) which is a hard thing for even well-developed firms to manage well. Anyone else shudder thinking this could be another Opera Bastille? The ny times had a write up on it that gives some background to the relationship between Guggenheim Foundation and the city. It sounds like they're trying to run an art institution following the dvelopment model of American professional sports teams: the city pays for the building; the franchise enjoys the profits. If thats the case I cant say I support this, charming design or not. BTW what ever came of the Kiasma Museum - and where will this fit into Helsinki's arts program? I havent seen anything that gave me a clear idea what kind of art is going to be showing here, and why Helsinki is the right place to show it. You appear to be way outside of the buildable envelope there Euclid. Well, whatever since the jury threw out the brief there are no objective criteria to judge this design on and even a subjective impression is invalid. So given that, what can one say? Would I get on an airplane and make a pilgrimage to visit this building? No. If I was in Helsinki, would I make sure to visit this building? No. If I was walking in the area of this building, would I cross the street to go inside? Yes. If I did not have the money for admission, would I walk 2 blocks to an ATM machine? No. Would I pay the admission price if there was a Jell Koons exhibit? No. Would I walk 10 blocks to an ATM machine if there was a Romare Bearden exhibit? Yes.